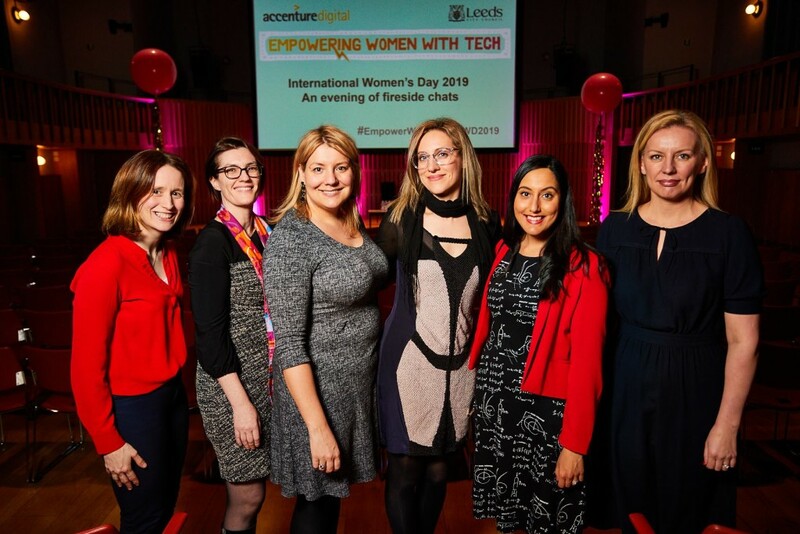 Rocket Women were honoured to celebrate International Women’s Day 2019 with Empowering Women With Tech. Rocket Women Founder Vinita Marwaha Madill participated in a series of Fireside Chats with truly inspirational women in tech, including Ana Jakimovska (The Guardian’s Director of Product Management), Niamh McKenna (Managing Director, Accenture Health UK), Milena Nikolic (Director of Software Engineering, Google), Eve Roodhouse (Chief Officer Economic Development, Leeds City Council) & Councillor Rebecca Charlwood (Leeds City Council). 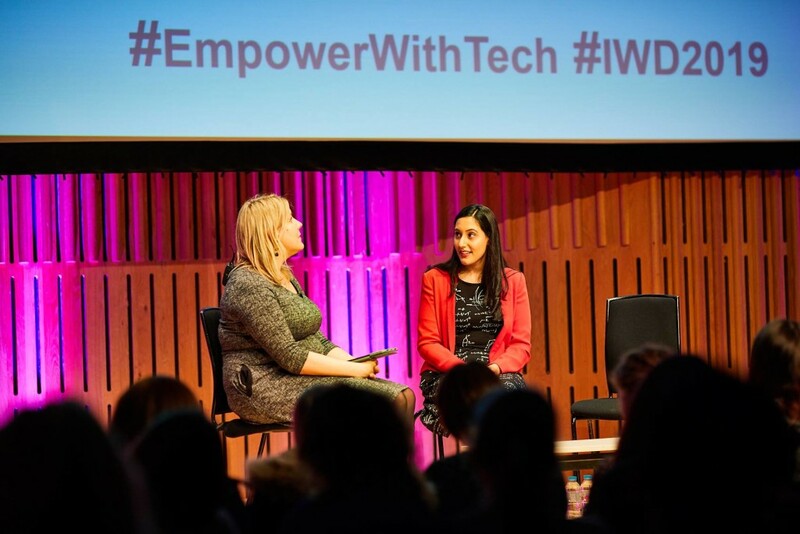 The event was organised by the amazing Natasha Sayce-Zelem, Head of Technology for Digital Service at Sky and founder of Empowering Women with Tech and took place in the Howard Assembly Room of the Opera North Grand Theatre in Leeds, UK with an audience of around 300. Highlights of the Empowering Women with Tech International Women’s Day evening included The Guardian News and Media’s Director of Product, Ana Jakimovska discussing the dangers that journalism is facing at the moment and the focus of her career, “My career has been mission-driven to make a difference. I realised the impact of the output of organisations including BBC & Channel 4.” Accenture Health UK’s Managing Director Niamh McKenna emphasised the importance of saying yes to opportunities and then figuring out how to do them later. Vinita Marwaha Madill, representing Rocket Women, talked about how to empower young women to choose a career in STEM and the importance of allies believing in your abilities and supporting your goals. Thank you to Empowering Women with Tech for inviting Rocket Women to celebrate International Women’s Day in the UK alongside some trailblazing role models! 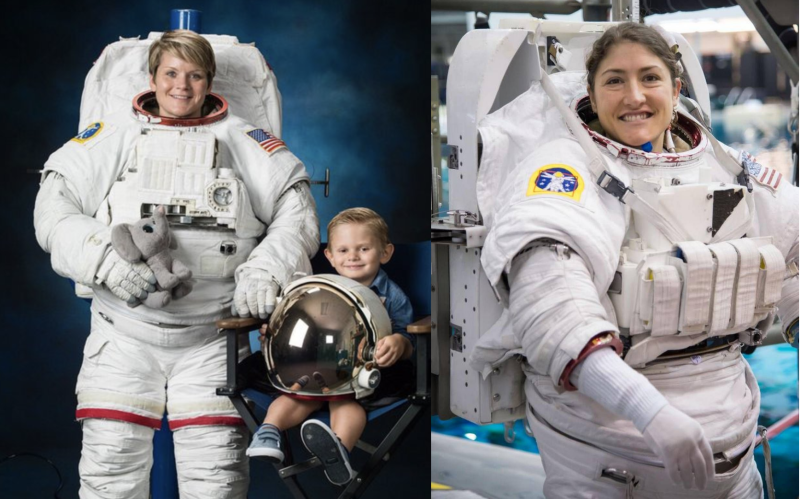 NASA Astronauts Anne McClain and Christina Koch are scheduled to make history, conducting the first all-female spacewalk (or EVA – Extravehicular Activity) on 29th March 2019, during Women’s History Month. Almost 35 years after Cosmonaut Svetlana Savitskaya became the 1st woman to walk in space on 25th July 1984. The title of the most experienced female spacewalker (and the third most experienced spacewalker ever) is held by NASA Astronaut Peggy Whitson. Peggy’s astounding 665 days in space (cumulative) also makes her the most experienced NASA Astronaut ever! Peggy Whitson made history in 2008 as she took over command of the International Space Station (ISS), becoming its first female commander. A spokesperson from NASA confirmed that the 29th March spacewalk will be supported in NASA’s Mission Control by lead Flight Director Mary Lawrence, and lead EVA (spacewalk) flight controller Jackie Kagey. The recent 2018 NASA flight director class chosen was 50% female, as was the 2013 NASA Astronaut class that both Anne McClain and Christina Koch were selected in, the highest female ratio chosen. The most recent 2017 NASA astronaut selection brought the percentage of female NASA astronauts in the NASA Astronaut Corps to just over 30%, this thirty years after Sally Ride became the first American woman in space. Here’s to hoping that all-female spacewalks will become commonplace in the future! Taylor Richardson is on a mission to become an astronaut. 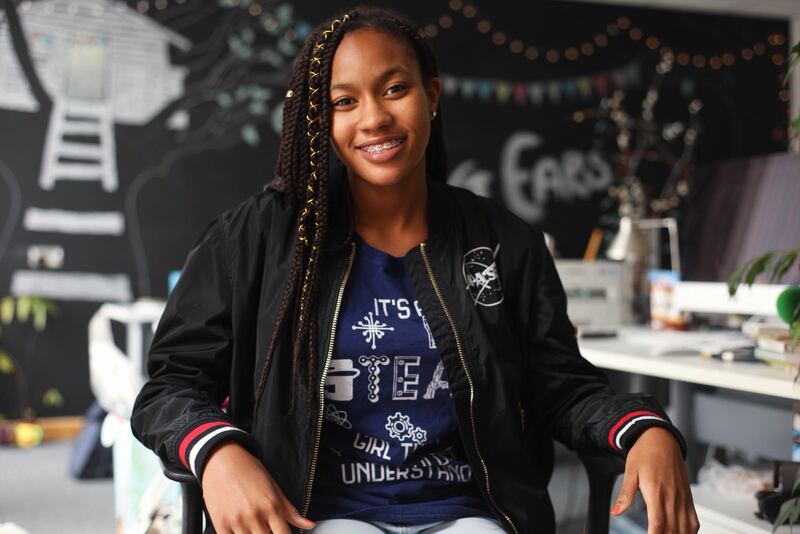 Along her journey she has impressively raised almost $20,000 to send girls to see the movie Hidden Figures, encouraging them to join STEM, and has recently raised over $110,000 to send girls to see the movie A Wrinkle In Time! Her notable support for the campaign is inspired by the fact that, “It’s a fantasy film that is not about some white boys fighting evil, but about a black girl overcoming it.” In the second installment of a new series featuring the next generation of Rocket Women, Taylor talks to Rocket Women about her focus to become an astronaut, her amazing advocacy campaigns and the importance of seeing role models that reflect you. How were you inspired to choose a career in the space industry and what fuels your passion for space? Reading Dr. Mae Jemison’s book, “Find Where The Wind Goes”, had a big impact on me. And once I attended space camp in Huntsville, Alabama, it was solidified that I was going to be an astronaut and go to Mars one day! My passion is fueled by space – the final frontier. When I was younger one of my favorite things to do at night was lie out in the yard and look up at the stars. 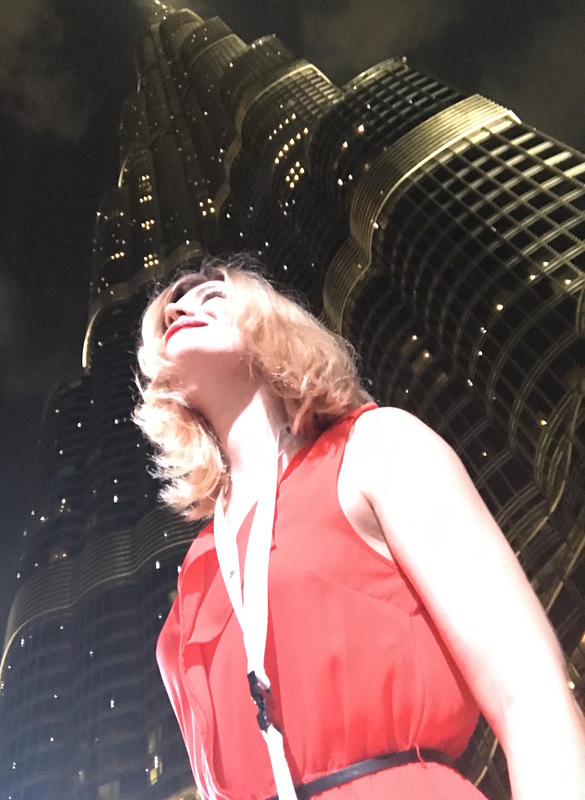 It was beautiful, mysterious and exciting to wonder what is up there and how I can get up there. There is a whole universe out there for me to explore and I can’t wait to be able to do so. Can you talk about your goal to become an astronaut and your journey to achieve this? Once my curiosity was sparked it was all about research. After attending space camp I visited various space centers and had the opportunity to meet with a number astronauts and ask them about their journey. Now it is all about doing well in high school so that I get into a great college. That’s my focus right now. Congratulations on your Hidden Figures campaign and for raising over $25,000 to send 1,000 students to see the film A Wrinkle in Time! A new GoFundMe campaign aims to highlight a exciting documentary titled ‘Astronaut Starbright’ about your dedicated work to champion STEM and pursuit to become an astronaut! How did these campaigns come about and why is your work so important? After I received a community service award from the Governor of Florida I got invited to a private screening of Hidden Figures at The White House with First Lady Michelle Obama and the film’s creators. The film inspired me to create a fundraising campaign so some local youth in Jacksonville could see the film. That’s how it all started. The work is important because there is a lack of highly visible representations of women in STEM positions, and even less for black women in STEM careers. I know that lots of girl like math and science but they turn to other things when they never hear about women in STEM or even have women as math and science teachers. We just want to be represented, and we still are not there yet. I think more encouragement and inclusion is needed. There is a lack of highly visible representations of women in STEM positions, and even less for black women in STEM careers. I know that lots of girl like math and science but they turn to other things when they never hear about women in STEM or even have women as math and science teachers. We just want to be represented, and we still are not there yet. A little late but appreciation post #3 goes to 4 people who keep me going and inspire me everyday to engage and empower girls and boys to know they can be anything they want to be! Thank you @missjade_allstar @asd.space.mum33 @thetinydiplomat @carter_the_trademark for keeping me on my toes and inspiring me! Continue to shine bright and know #youareappreciated! Who have been your role models growing up? How important are role models to young girls? I have many role models. Some older, some younger than me. My biggest two roles are Dr. Mae Jemison and my local mentor Mr. Darnell Smith. I call him Uncle D now. I’ve known him since I was nine and he’s been right by my side through this journey called life with me. Guiding me with support and advice that ensures I do things right. And even when I mess up he’s there to support. I think one of his most endearing qualities is his genuineness. He touches everyone in a way where you can immediately connect with him. He’s patient and supports me in everything that I do. He teaches no judgment, only lessons learned! And when I do fail or make a mistake he makes me feel better by telling me his stories of failure and achievements throughout life. He always tells me to continue my faith in God, be kind to my mom, serve and help others and to be my best self. I hope that I’m making him proud. He’s definitely impacted my life by how I’ve watched him live his. With the kindness, faith and service. What can I say about Dr. Mae Jemison, first African American female to go to space. She’s my shero! Seeing her makes me feel like I can do anything as long as I put my mind to it. Having someone like Dr. Jemison. who looks like me. makes me feel good about myself. She’s not just an African American role model, she’s a role model for all people and girls like me who want to live their dreams of becoming astronauts. Which is why it’s so important for girls to have role models they can look up to and role models that are reflections of them. How did your family help to shape your career path in STEM? My mom probably help most shape my interest in STEM by ensuring I had equal opportunity to resources like books, STEM camps and clubs. Being a good support system for me as well has help me stay encouraged focus and determined to achieve my dream. What does the world need more and less of? With everything going on in the world it could definitely use more love and less hate. I hope people will to be more accepting and inclusive to make the world a better place. To raise their voices up and act big in a positive way. If you had one piece of advice for your 10-year-old self, what would it be? Would there be any decisions that you’d have made differently? Own your power, be the one who stands out in the crowd, who speaks up, and is either the voice they need to hear, or a voice for others. Seek out mentors, coaches, and investors because camps are not cheap. Don’t be discouraged and fight for your dream because we need you! I hope that kids will see me and know that with hard work, faith, and determination they can reach their goals, STEM or not. 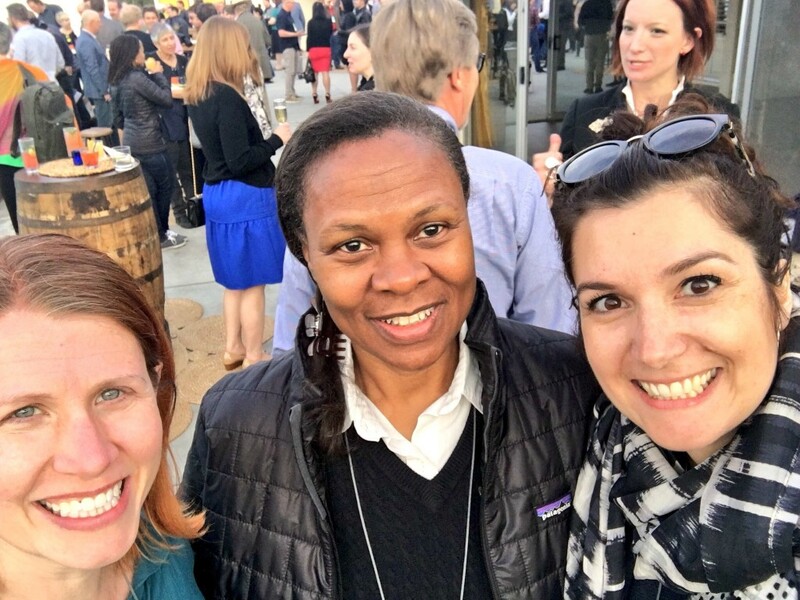 It would be nice to have more people, more organizations, more companies be intentional and ensure people of all backgrounds are represented at not just the STEM table but all tables. 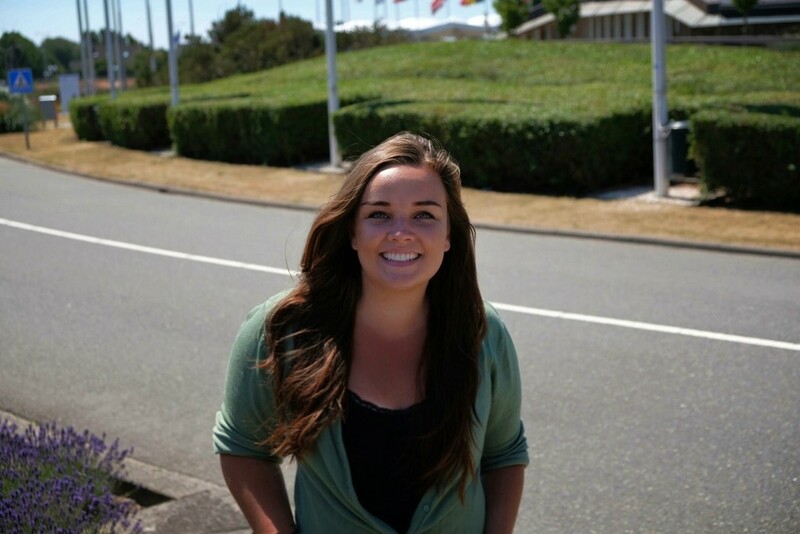 At 24-years-old, Bethany Downer is on the road to achieving her dreams in space. She has recently become the first scientist-astronaut candidate from Newfoundland, Canada through Project POSSUM, with upcoming training including high-G aerobatic flight training, similar to the forces astronauts experience during rocket liftoff and re-entry to Earth, and was invited to lunch with her excellency Julie Payette, the former Canadian astronaut and current Governor General of Canada. Bethany talked to Rocket Women about pursuing her passion and the one piece of advice she would give her 10-year-old self. Congratulations on becoming the first scientist-astronaut candidate from Newfoundland under Project POSSUM! Your mission has been to inspire everyone from all walks of life to become engaged with space. Can you talk about your journey to become an astronaut and how you hope to achieve your goals? My first step was to develop as much knowledge as I could. I’ve always loved school and learning, so this task was embraced with enthusiasm. I achieved my BSc in Geography to learn as much about the Earth’s systems as possible, followed my a masters in Space Studies from the International Space University in France. From here, I found my niche and area of skill/interest in communications. My passion is for communicating the technology and science of the space industry to the general public and to alter the perception of “rocket science” being beyond general comprehension. I genuinely enjoy taking something like a new finding in astrophysics or the development of a new rocket engine concept, and bringing its language and content to a simpler and more accessible level. I genuinely enjoy taking something like a new finding in astrophysics or the development of a new rocket engine concept, and bringing its language and content to a simpler and more accessible level. In this domain, I’ve worked for various agencies and organizations. These include the European Space Agency (ECSAT), Design&Data, Leiden University Observatory, SES Networks and the Space Generation Advisory Council. I’ve also developed my own website that actively communicates the science and technology of the industry, called Reaching Space Science. I’m also in the process of publishing a book. 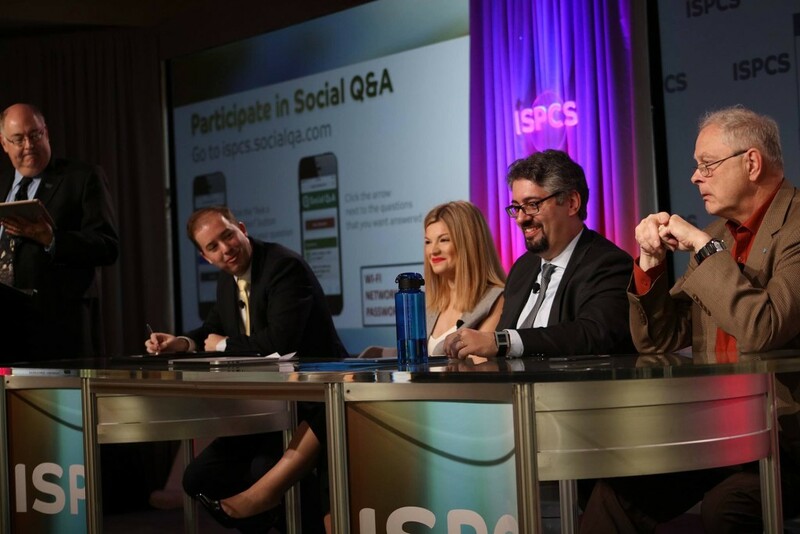 When applying for PoSSUM, I emphasized that this was my skill and passion – communicating research and technology – and as this program focuses on important climate change research in the upper levels of the atmosphere, I could be of benefit in terms of disseminating this important work to broader audiences. I am very excited and honoured to take part in this program that will be preparing me for conducting research in the next generation of suborbital commercial vehicles. Designed and instructed by former NASA astronaut instructors and PoSSUM team scientists, just some of the training that the program includes is high-G aerobatic flight training (to experience higher gravitational forces like those experienced during rocket liftoff and re-entry to Earth), crew resource management training, spacesuit training, high-altitude training, biometric analysis, and camera operations. My interest in space has always been inherent, I did not have a lightbulb moment that made me realize that this is what I want to do – I’ve simply always loved it. I’ve had helpful advice along the way (such as support from Canadian astronaut Chris Hadfield) that also encouraged me to develop myself beyond the space realm. For example, in 2014 I founded a federally-incorporated non-profit organization that operated across Canada to encourage sustainable practices by bringing unwanted shoes to those in need. Through the education of sustainable consumerism, the program redistributed over 18,000 shoes to more than fifteen countries worldwide and retained over 14,000lbs of waste from Canadian landfills. I brought talks and lectures to more than 5,000 youth of Newfoundland and I truly feel this experienced developed necessary skills that I still rely on today, such as public speaking, media relations, leadership and networking. In 2014 I founded a federally-incorporated non-profit organization that operated across Canada to encourage sustainable practices by bringing unwanted shoes to those in need. Through the education of sustainable consumerism, the program redistributed over 18,000 shoes to more than fifteen countries worldwide and retained over 14,000lbs of waste from Canadian landfills. Who were your role models when you were growing up? How important are role models to young girls? Growing up, without realizing it, my role models were always women. This included my mom and grandmothers, but also in school when assigned hero or role model essays, I always selected distinguished women. In particular, I grew very familiar with (and always looked up to) the careers of Sally Ride (the first American woman in space), Roberta Bondar (Canada’s first female astronaut and the first neurologist in space), and Julie Payette (former Canadian astronaut and current Governor General of Canada). In fact, just last week I was invited to have lunch with her excellency, so this was a very meaningful and memorable discussion. Role models are of integral value to young women. I’m confident that having a visible example of a profession or career that a young person wants to achieve can be highly motivating and validating for them. 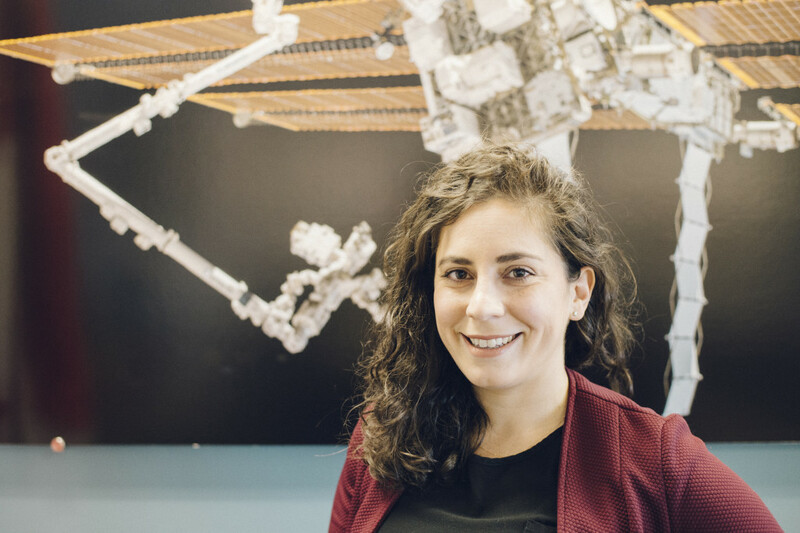 Since I began my work in the space industry and my recent training with PoSSUM, I’ve very much made it my personal goal to make space careers more accessible to those from my home province of Newfoundland, particularly to young girls. When I was young, I often dismissed my dream of working in space because I did not have a nearby or accessible example of someone who was actively working in the space field and doing the type of work I was interested in. I’ve been scheduling dozens of school and scout/guide group visits to help make my involvement in space as accessible as possible to those from home so that they don’t have to dismiss their career ambitions, whether they are pertaining to space or not. I’m also actively looking at ways to bring more space-related courses at the university level to my hometown as well. There’s a lot of work to do, but I hope to use this new (and unexpected!) public platform to make meaningful and lasting change. To me, success means that you’ve found a way to do something for a living that makes you feel fulfilled and happy. I think its also important to establish yourself in a career in which you are learning everyday to not only better yourself, but to expand upon you knowledge and experiences. This success is best celebrated and cherished when you have the right group of encouraging friends and family. How do you think the space industry has changed for women over the years? Has it become more inclusive? I am genuinely inspired by the success and achievements of women that have spearheaded important developments in the space industry. I am confident that the matter of inclusion is significantly improving. By highlighting and sharing stories of what women around the world are doing in space, in various different fields, there is a communal sense of encouragement in that we all wish to support and motivate one another. I think with time, we have grown to accept and integrate the invaluable knowledge and experience women have to offer the space industry. I am confident that the matter of inclusion is significantly improving. By highlighting and sharing stories of what women around the world are doing in space, in various different fields, there is a communal sense of encouragement in that we all wish to support and motivate one another. Was there anything unexpected about your career journey that you thought would be different to your initial expectations? Growing up in Newfoundland, Canada I was not exposed (or perhaps naive) to the realities of sexism that exist, not only in the space sector but in general. This was something that surprised me, but the initial discouragement was quickly flipped when I spoke with and was exposed to the vast work and accomplishments being undertaken by the countless women worldwide who are conducting inspiring work in various disciplines within the space sector. I’ve also been surprised to learn just how small the space sector truly is – the networks and connections made are all related and it is always exciting to catch up with new and old faces. 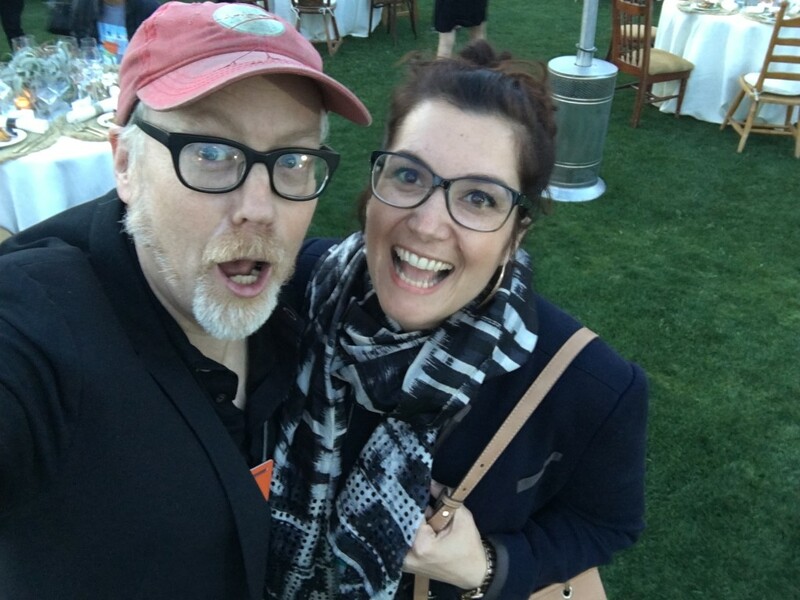 I’ve also been surprised to learn just how small the space sector truly is – the networks and connections made are all related and it is always exciting to catch up with new and old faces. Aside from my family being extremely supportive and my parents coming from an engineering and science backgrounds themselves, while in grade school I participated in several engineering and science camps. I was actively exposed to many STEM areas that helped me decipher what my specific interests were. I am forever grateful for the support that my family gave me since I discovered my love for space, as they always encouraged my academic and professional pursuits, wherever and whatever they were. I don’t regret anything that’s gotten me to where I am now. I’ve learned to embrace failures and setbacks (from lost awards or scholarships, failed relationships, academic or job rejections – anything). All of these gave me opportunity to grow, and instead lead me to alternative opportunities that put me on the path to where I am now. I consider where I am now a blessing and exciting, so I can’t regret whatever got me here. To my 10-year old self, I would stress that there is no wasted knowledge or experience. Take the most of every opportunity and of everyone you meet. I would reassure myself that although things will be hard, things will work out and that there is reward to hard work. 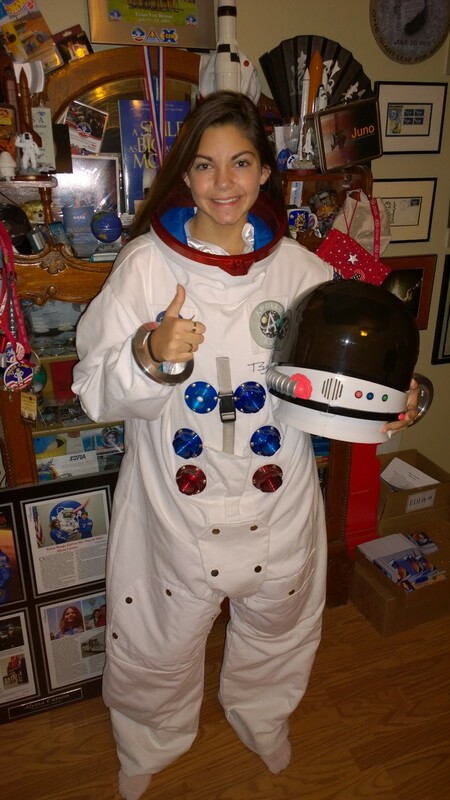 Bethany is currently raising funds for her POSSUM programme and travel to Florida, in order to allow her to carry out the POSSUM astronaut training. Any leftover donations will be put towards the development of an education program and talk tour across Newfoundland, Canada and other space outreach activities for the province. Any and all donations are sincerely appreciated by Bethany. Check out her GoFundMe page here! 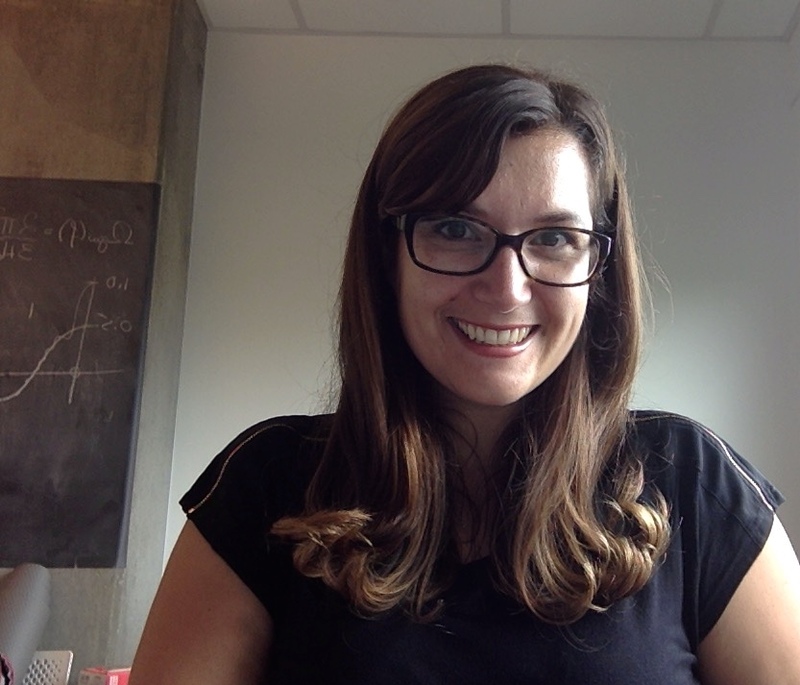 Rocket Women are thrilled to feature astrophysicist and trailblazing role model Dr.Chiara Mingarelli. Chiara tells Rocket Women about how she was inspired as a child by Eve Curie’s biography of her mother, Marie Curie, the importance of supporting those marginalized in STEM and giving a talk to Jeff Bezos at the Amazon MARS event! Tell me about your journey to astrophysics and to where you are now? I grew up in a small town called Rockland, Ontario, close to Ottawa – the capital of Canada. I loved looking up at the night sky, full of stars, and dreaming of making a discovery. When I found out about black holes, and that one could study black holes for a living, I was hooked! I did my undergraduate degree in Mathematics and Physics at Carleton University in Ottawa, and then moved to Europe to pursue my graduate work. I did my Master’s degree at the University of Bologna in Italy, and my PhD in the UK, at the University of Birmingham, where there is a large gravitational-wave group. After my PhD, I won a Marie Curie Fellowship, which I took to Caltech for 2 years, after which I had to return to Europe. When I found out about black holes, and that one could study black holes for a living, I was hooked! I spent the final year of my fellowship in Bonn, Germany, at the Max Planck Institute for Radio Astronomy. This whirlwind tour brings us to today! After my year in Bonn, I got an offer to join the new Center for Computational Astrophysics at the Flatiron Institute in New York, as a Flatiron Research Fellow. This is where I am now! It’s a great place to work: my colleagues are all world-class and I have been able to expand my research interests (and soon publications!) through my conversations with them. What are your favourite things about your workday? I love talking to my colleagues. I am very fortunate to be surrounded by some of the brightest minds in astronomy and astrophysics, and it is a joy to talk to them about their work and how it sometimes interfaces with mine. If I’m lucky, I’ll have a day when I have a great idea! This is really the best part of my job – thinking of new ways to learn about the Universe that other people have overlooked. Who were your role models when you were growing up? How important are role models to young women? My parents read me Eve Curie’s biography of her mother, Marie Curie, to me as a bedtime story. I learned that Marie Curie won 2 Nobel Prizes, so I set out to win 3! This was before I found out that only two women have ever won the prize, despite there being a huge pool of talent to draw from, so I am not particularly hopeful of this anymore. Instead, I hope to be a role model myself, and encourage women to pursue what they are passionate about, especially in STEM fields where we are underrepresented. My parents read me Eve Curie’s biography of her mother, Marie Curie, to me as a bedtime story. I learned that Marie Curie won 2 Nobel Prizes, so I set out to win 3! One of my modern role models was Dana Scully in the X-Files. She was a serious, skeptical scientist who I deeply admired, and was in turn respected by her colleagues for her keen intellect. I was also inspired by Canadian astronaut Roberta Bondar, who was the first Canadian woman astronaut, and continue to be inspired by trailblazers like Jane Goodall – a pioneer in primate studies. I believe role models to be of crucial importance to young women, even though they may not realize it. It’s hard to imagine who you want to be if you’ve never seen anyone who looks like you being an astronaut for example. One of my modern role models was Dana Scully in the X-Files. She was a serious, skeptical scientist who I deeply admired, and was in turn respected by her colleagues for her keen intellect. I was also inspired by Canadian astronaut Roberta Bondar, who was the first Canadian woman astronaut, and continue to be inspired by trailblazers like Jane Goodall — a pioneer in primate studies. I didn’t expect there to be such a sharp transition from the way people interacted with me as a undergraduate student to a graduate (PhD) student. As an undergraduate I couldn’t understand why I would need feminism, everything seemed fine, why waste one’s breath? As a PhD student I was shocked at the huge differences in which men and women were treated. As an undergraduate I couldn’t understand why I would need feminism, everything seemed fine, why waste one’s breath? As a PhD student I was shocked at the huge differences in which men and women were treated. This was my first experience with being frequently interrupted, not being listened to and having other claim your ideas as their own a few minutes after you share your idea. It was like being in another dimension. This was my first experience with being frequently interrupted, not being listened to and having other claim your ideas as their own a few minutes after you share your idea. It was like being in another dimension. This has also taught me the importance of being an ally to those who suffer these experiences more regularly than I, and are marginalized in different ways due to their race or gender nonconformity, for example. What has been the most rewarding moment in your career so far? I am fortunate to have had many rewarding moments in my career. The most memorable are giving a talk in Feynman’s lecture theatre at Caltech when I was a postdoc there, giving a talk to Jeff Bezos and the amazing people gathered at the “Amazon MARS” event this year in Palm Springs, and seeing my 2017 Nature Astronomy paper published after more than 1.5 years working on it! Don’t ever stop believing in yourself. You’re amazing, and don’t let anyone tell you otherwise. Happy International Women’s Day 2018! On International Women’s Day, Rocket Women are celebrating the achievements of trailblazing women in space! This week we’re featuring Canadian Space Agency (CSA) Robotics Flight Controller Kristen Facciol! 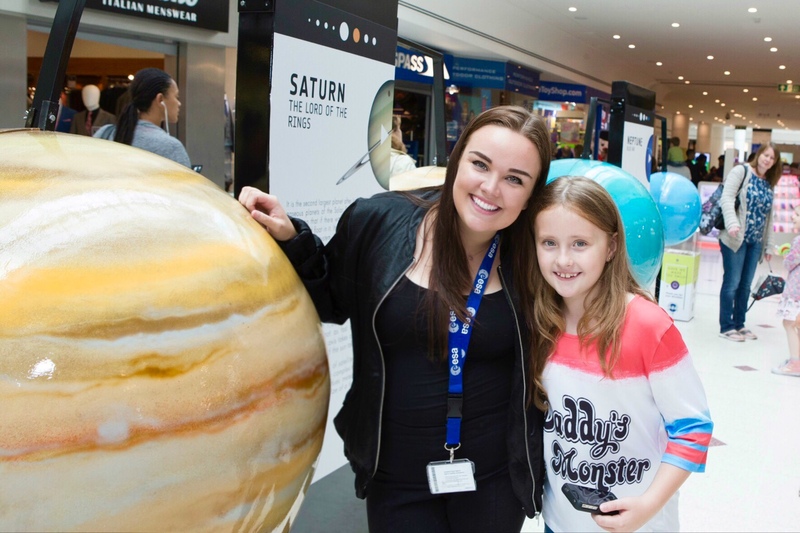 Growing up in Canada, Kristen was inspired by the achievements of Canadian astronauts Roberta Bondar and Julie Payette and always hoped that she could be involved with Canada’s contributions to space exploration one day. 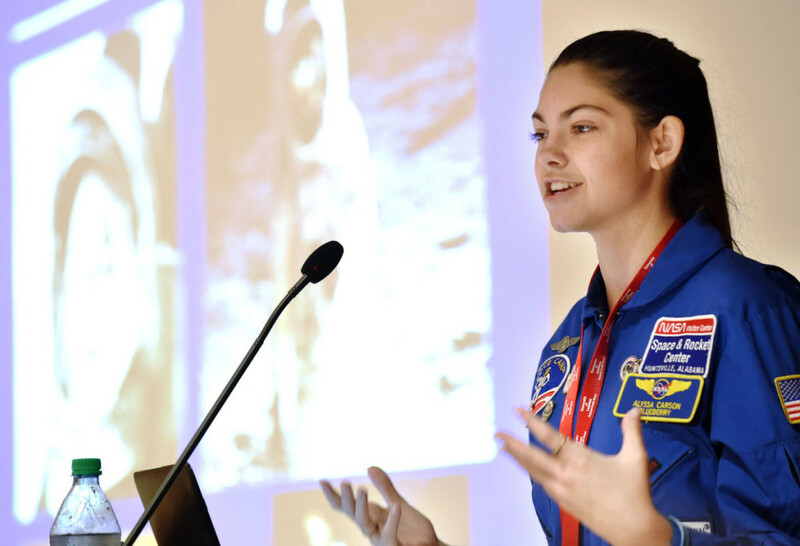 Kristen tells Rocket Women about her path to work at NASA’s Johnson Space Center, astronaut training and why she believes it’s important that we show the next generation that it’s possible to be successful in non-traditional careers. Tell me about your journey to the space industry and to where you are now? My journey began when I was about 10 years old and was able to attend Space Camp in Montreal, Canada. I learned about the Canadarm, the Space Shuttle program, and the Hubble Space Telescope, and immediately became intrigued. Space exploration was a passion that fuelled my interest in science and math. When it came time to select a university, the University of Toronto stood out because of the affiliated Aerospace Institute (UTIAS), and the ability to major in Aerospace Engineering through the Engineering Science program. It was during university that I realized my interest in robotics. The opportunity of a lifetime came up when I joined the Mission Control Group. I am now living in Houston, Texas and training as a Robotics Flight Controller at NASA’s Johnson Space Center. Following graduation, I started with MacDonald, Dettwiler and Associates (MDA) as part of a team designing robotic systems for on-orbit satellites servicing. Upon completion of this project, I moved to Montreal to work as an embedded contractor at the Canadian Space Agency (CSA) as both an Analyst and an Engineering Support Lead for robotics operations on the International Space Station (ISS). During this time, I also certified as an instructor, training astronauts and flight controllers on the Mobile Servicing System, which includes Canadarm2 (the large robotic arm on the ISS), Dextre (a robot performing maintenance work and repairs), and the Mobile Base (which allows translation along the ISS). At the end of 2016, I joined the CSA as a Payloads Engineer, working on some of the human research projects conducted on the ISS. Soon after, the opportunity of a lifetime came up when I joined the Mission Control Group. I am now living in Houston, Texas and training as a Robotics Flight Controller at NASA’s Johnson Space Center. Describe a typical day at work for you. A typical day at work can really vary, which is one of the many reasons why I love my job! When we are planning for robotic operations, we need to go through the Mission Design process. We look at requirements or objectives that need to be satisfied during an operation, and take into consideration the complexity of the ISS operational schedule. Using a simulator, we then develop the procedures and other associated products that allow us to control the robotic systems on the ISS from the ground. The days that I get to train astronauts and flight controllers, are some of my favourite days! There are also days that I sit on console, either training during real-time operations or learning as part of simulations. Sitting on console involves monitoring our systems and the timeline, as well as the status of all the other systems that comprise the ISS, to ensure the objectives of the operation are met. Then there are the days that I get to train astronauts and flight controllers, which are some of my favourite days! 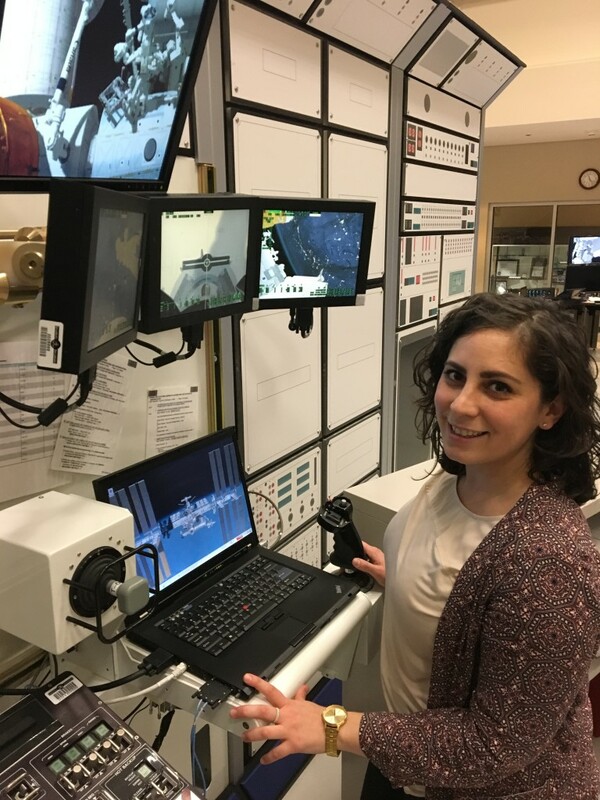 It is an opportunity to ensure that I am constantly learning and understanding how our systems work, as well as pass on this knowledge to future operators of Canadarm2, Dextre, or the Mobile Base. Growing up, my role models were anyone that took the time and effort to teach me, or anyone I felt I could learn from. This included my parents, my coaches for various sports, my teachers, and my colleagues. I never shied away from an opportunity to learn and improve, and always had a desire to be better at whatever it was that had my attention at the time. I always admired the achievements of Roberta Bondar and Julie Payette. I hoped that I could one day be involved with Canada’s contributions to space exploration. I never shied away from an opportunity to learn and improve, and always had a desire to be better at whatever it was that had my attention at the time. I think it is exceptionally important for young girls to have role models. One thing that has always stood out to me is the way females are portrayed in the media, and the stereotypes that continue to exist today from previous generations. We need to show the next generation that: it is possible to be successful in non-traditional careers; it is possible to have a career as well as a family; and it is possible to be driven and successful without that having a negative connotation. We need to show the next generation that: it is possible to be successful in non-traditional careers; it is possible to have a career as well as a family; and it is possible to be driven and successful without that having a negative connotation. There have been technical achievements that were quite exceptional, but there are also the “softer” moments that have made an impact as well. Two of the technical achievements that stand out were the first time an astronaut I had trained was on-board the ISS and the first time a procedure I had written was executed on-orbit. It was so surreal to watch live video from the ISS of something that I had worked on from the ground. It is still difficult for me to truly express the way each of these moments felt. It was so surreal to watch live video from the ISS of something that I had worked on from the ground. It is still difficult for me to truly express the way each of these moments felt. I have also received some incredibly heartwarming messages from people that I have interacted with as a mentor. To know that I have somehow influenced the career path of another person is something I am so grateful to have experienced, and there really is nothing quite like it. What would you recommend to someone looking at a career in space robotics to focus on? To develop a foundation for a career in space robotics (or robotics in general), it is important to focus on more than just the technical courses and training that are required. You also need to keep apprised of what is happening in your field of interest. There are advancements every day – not just in space, but also in how what we have learned in space is utilized here on Earth. Knowing where we have come from and the direction we are moving in will help you to strategically position yourself to be a part of the way forward. Knowing where we have come from and the direction we are moving in will help you to strategically position yourself to be a part of the way forward. For any career consideration, it is also important to keep in mind that a technical career is more than just the technical elements. 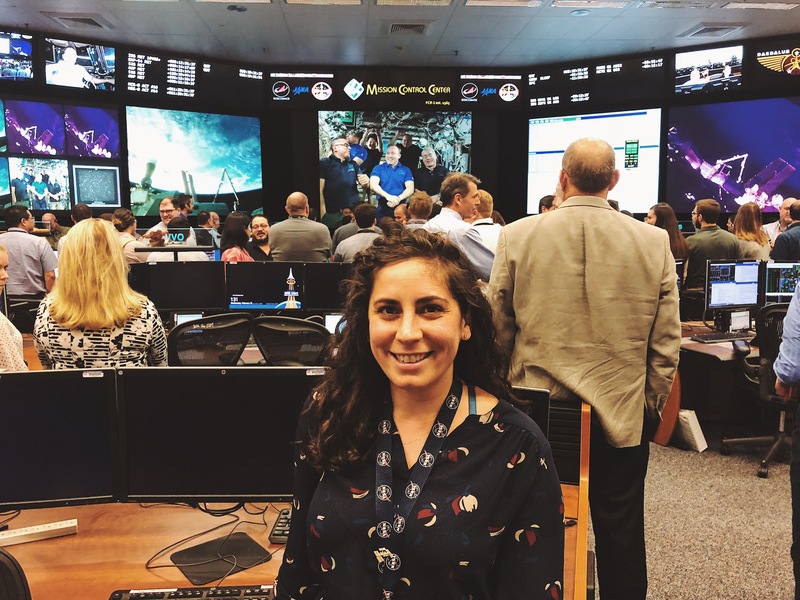 Working in space robotics, as part of an interdisciplinary team, has really emphasized the importance of being able to work with others and to understand how your systems interact. You need to be able to communicate the state of your system and to adapt to changes in the surrounding environment. It also often involves working under pressure. Looking back to when I first started, I thought that I would stay in Toronto and be a career “lifer”. I really admired my colleagues that had established a reputation for themselves to be a go-to person and become indispensable to a certain extent. I thought that was what I wanted. I took somewhat of a leap of faith when I moved to Montreal. If it had not been for that move, some of the most important events in my life would have never occurred. My life has been ever changed because I took that leap. Being given an opportunity to work at the CSA was a daunting decision at first, but it was definitely a clear one. This was the Canadian Space Agency that I would be working at! If it had not been for that move, some of the most important events in my life would have never occurred. My life has been ever changed because I took that leap. My 10-year-old self already exhibited many of the qualities that I think are important contributors to where I have reached at this point in my life. She approached everyone in the same way, whether stranger or friend, superior or equal. She was a team player but a definite leader. And she always strived to be the best. She also had her moments of self-doubt, and I would want to tell her to never doubt herself, her achievements, or the decisions she made. I would tell her that she was going to end up somewhere she never even dreamed was possible. I would probably also mention that being a nerd would become the new cool, but I doubt she would have believed me. I would want to tell [my 10-year-old self] to never doubt herself, her achievements, or the decisions she made. I would tell her that she was going to end up somewhere she never even dreamed was possible. I would probably also mention that being a nerd would become the new cool, but I doubt she would have believed me. If I went back and made any decision differently, then I don’t know that I would have ended up where I am now, which I am very proud of. I really wouldn’t want anything to be any different. So looking back, I wouldn’t change a thing. The 11th of February marks the United Nations International Day of Women In Science, a day celebrating the achievements of trailblazing women in science, whilst aiming to inspire the next generation of physicists, chemists, engineers and biologists. I absolutely love this graphic by the Canadian Space Agency (CSA) to celebrate, showcasing the variety of careers available in the space industry! If you’re interested in a career in space be inspired by the stories of trailblazing Rocket Women featured today, from a Flight Controller in Mission Control to an Engineer designing the next generation of satellites, to a Geologist training astronauts for missions to the surface of the Moon and Mars, a Biologist designing novel human life support systems and an Astrophysicist unlocking the mysteries of the Universe. You don’t have to be the best in maths and science – you don’t have to be number 1 or number 2. You just have to want to help humankind. That should be the passion. You don’t have to be the best –just be proficient. We need to change the conversation to know that you’re all in. Remember, there are lots of different pathways to work in the space industry, even if you not looking to become an engineer, scientist or astronaut. 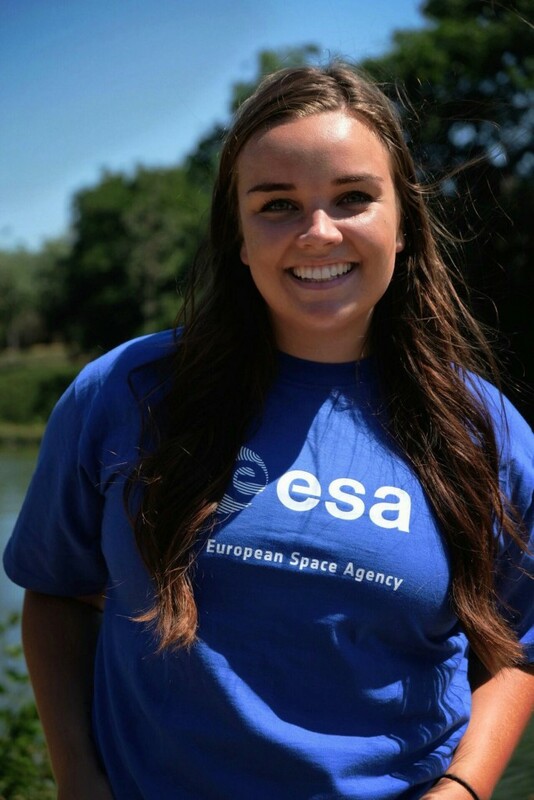 During a Rocket Women interview with Emma Lehnhardt from NASA, Emma rightly mentioned that although we need more female STEM graduates, “we also need policy wonks, like me, accountants, lawyers, artists, English majors, you name it.” In her interview with Rocket Women, Emma revealed a woman who really had an impact on her when she was an intern at NASA, named Lynn Cline. She had only ever had one meeting with her, but was absolutely struck that a French literature scholar became the Deputy Associate Administrator for Space Operations. To work in the space industry the most important thing that you can do is to study something that you love and are passion about. You have to enjoy what you study and the work that you’re doing. Pay attention to what your passion is for and follow that passion to find your ideal career in space. 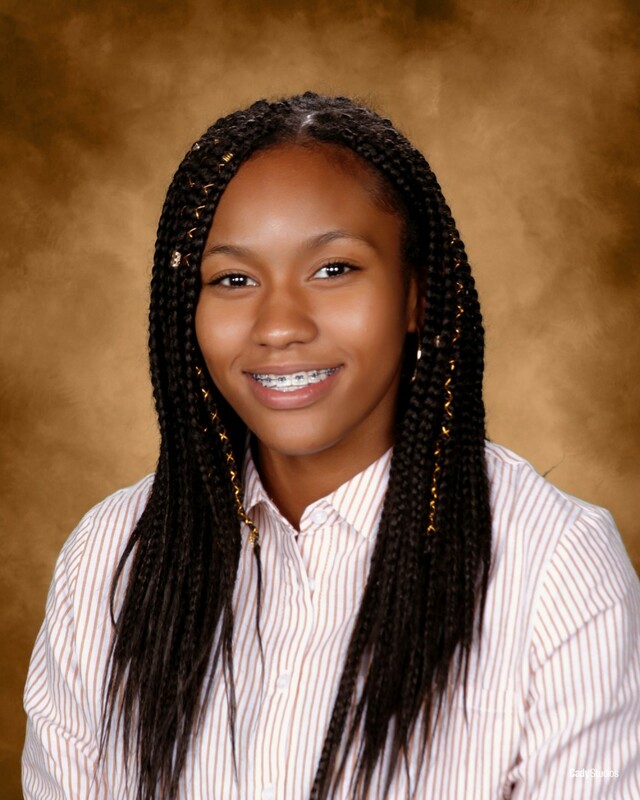 Alyssa Carson is a regular teenager, except alongside impressively taking her classes at school in four languages (English, French, Spanish, Chinese), she’s training to become an astronaut and travel to Mars. 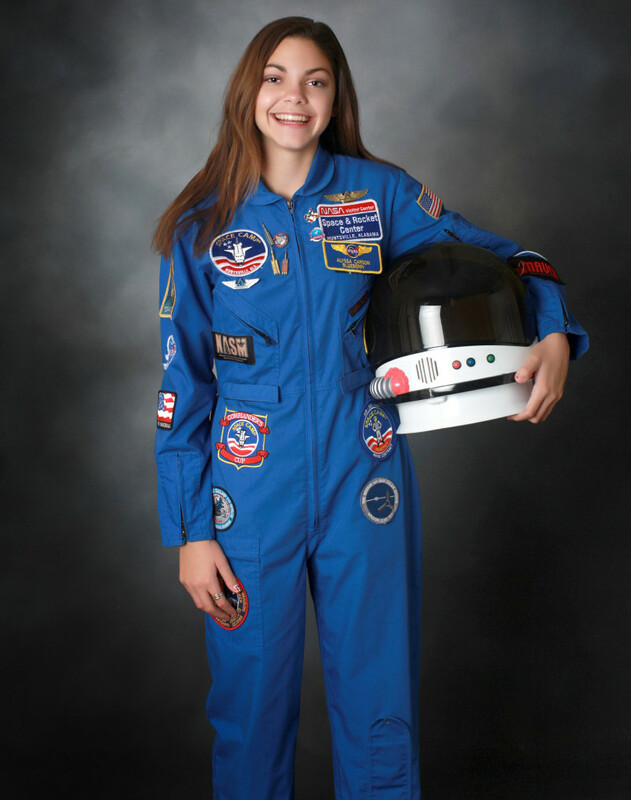 Alyssa is the youngest person to graduate from the Advanced Space Academy and the first person to complete every NASA space camp in the world! Alyssa Carson is certainly the most dedicated 16-year-old that I know of and her drive to become an astronaut has motivated me work harder! 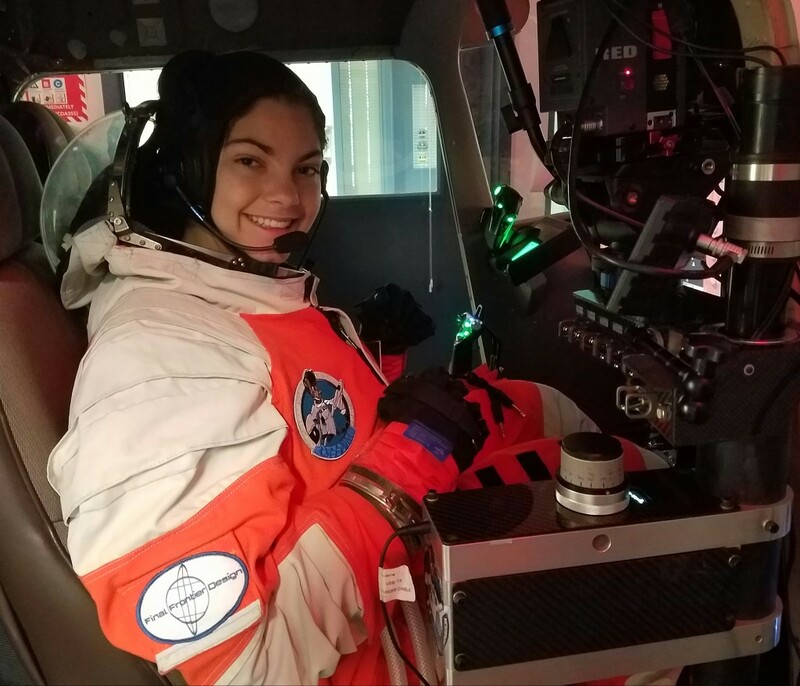 In a new series featuring the next generation of Rocket Women, Alyssa talks to Rocket Women about her drive to travel to Mars. How were you inspired to choose a career in the space industry and what drives your passion for space? I got inspired to become an astronaut and go to Mars while watching a cartoon television show called the Backyardigans. In this show there were friends who went on an imaginary trip to Mars. Watching this as a 3-year-old made me want to be like the characters in the show and travel to Mars. After the episode ended I asked my dad if humans had been to Mars and if it was possible to travel there. I was then fascinated with wanting to go to space. I began reading books, watching videos, and started learning everything I could about space, rockets and Mars. I never let go of my dream of becoming an astronaut. I was fascinated with wanting to go to space. I began reading books, watching videos, and started learning everything I could about space, rockets and Mars. I never let go of my dream of becoming an astronaut. Your goal is to become an astronaut and be one of the first people to step foot on Mars. Can you talk about your journey to become an astronaut and how you hope to achieve this? The journey for me to become an astronaut includes me completing the rest of high school and then going to college to get a degree in astrobiology. With that degree I could become a mission specialist and study the soil, water, and history of the planet Mars. After graduating college I will start applying to the astronaut selection program after my PhD and work in the astrobiology field as I continue to apply. Once selected I will train for the mission which is currently scheduled to happen in the 2030s. One of my biggest role models growing up was astronaut Sandra Magnus. I had the chance to talk to her when I was 9 years old at a Sally Ride Day Camp. When I spoke to her she told about how she she decided to become as astronaut at the age of 9. Hearing how she decided her career at a young age and then fulfilled it by going to space several times really inspired me that you can decide what you want to do at a young age and then accomplish those goals. Role models are extremely important to girls because it gives them someone to look up to. Also it is motivation to continue searching and following dreams. Success for me means becoming a mission specialist for the mission to Mars. Success for me means becoming a mission specialist for the mission to Mars. Also having the opportunity to make new discoveries by exploring a new planet. Another big success would be influencing as many kids as I can to follow their dreams and to help them as much as I can. My family has been a huge support in my dream. Even from the first time I mentioned the idea I had a lot of support. My dad especially has helped so much and enabled me to pursue the career that I wanted. I definitely would not be at the point I am now without him. It wasn’t too hard to keep myself motivated when the things that I was doing was tough. Sometimes things can be very busy and hard however the benefits that I am getting out of all these experience most definitely made up for it. I just had to remember that my goal required a lot work to get there and without it I wouldn’t be able to accomplish what I wanted. Everything has been an amazing experience and I can’t wait to see what lies ahead. The advice that I would give my 10-year-old self would be to cherish every moment because all experiences are once in a lifetime. I don’t really think I would have done anything differently since I began working on my dream. Everything has been an amazing experience and I can’t wait to see what lies ahead. 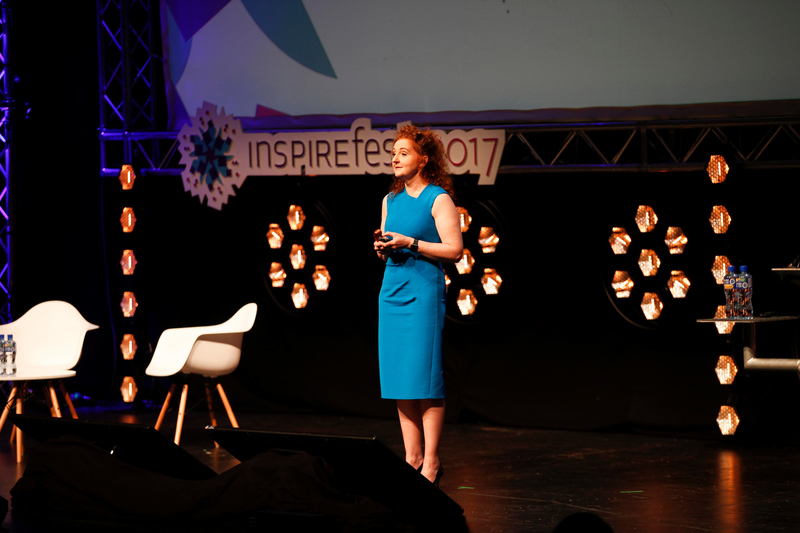 Dr. Niamh Shaw has dreamt of becoming an astronaut since she was a child and is actively making steps towards achieving her goal. 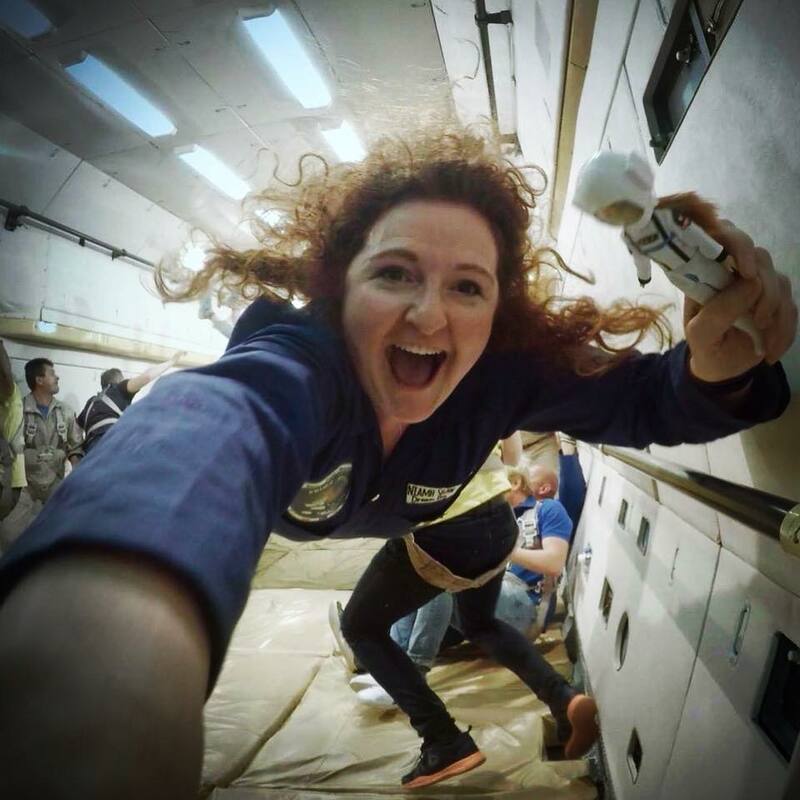 She tells Rocket Women about realising that her passion involved combining science and the arts, ultimately leading her to create international theatre shows and outreach to ensure that the public are brought along and inspired on her journey to space. It’s a very long story. Basically when I was very young, I was very clear that I wanted to go to space and as a child I wanted to be an astronaut. Because there were no role models in the town that I grew up or in Ireland indeed, apart from what you would see on television coming from NASA and the Moon landings, it was like I knew that I didn’t have permission to achieve that. I actually couldn’t figure out how to do it either. So it was a fear of failure and no one really pointing me in the right direction to do that. It became very clear to me that I hadn’t really let that dream go and I had to do something about it. So, I forgot about it for a very long time. Then I was making my very first theatre show, which was combining science and the arts together. I was looking at all of these decisions that I’d made, and one of them was about me wanting to be an astronaut as a child. While I was figuring that out, I realised that I got very upset because I’d done nothing about it. It became very clear to me that I hadn’t really let that dream go and I had to do something about it. That was in 2011 and since then I have been actively making steps towards ultimately achieving that goal. Making theatre is a big part of it. It allows me to share my personal story and I’m now on my third theatre piece. 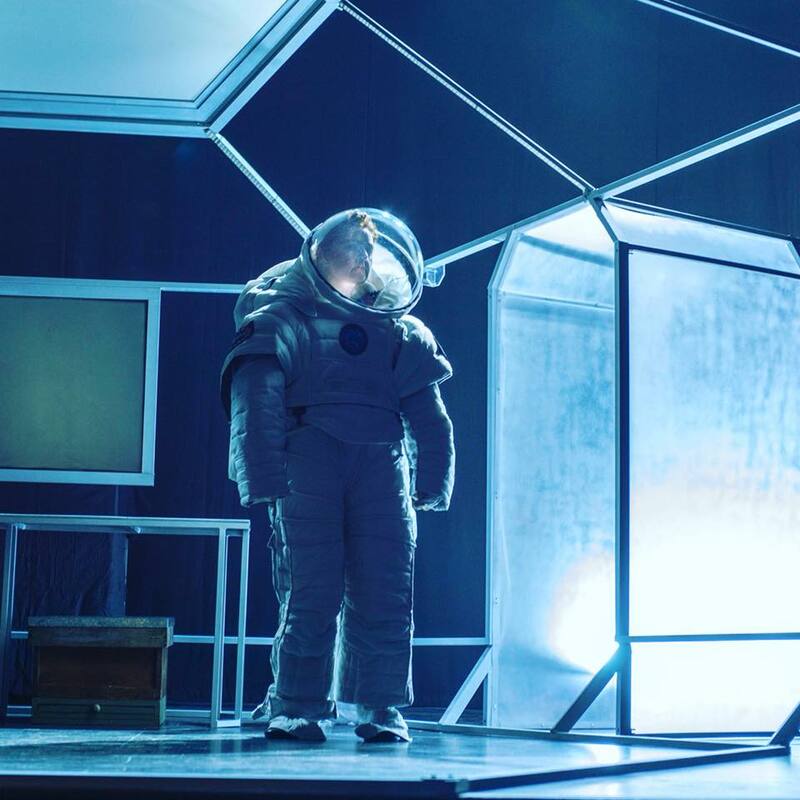 The second piece toured internationally – it toured to Edinburgh and it toured to Adelaide, and it help get the message out there. Every time I do a show it gives me more confidence and more belief that I can move forward. The latest show, ‘Diary of a Martian Beekeeper‘ is set in the future this time, as I’m on Mars and I’m conducting an experiment about bees. Because, as I’m on this space journey, bringing this environmental message into it has been very important to me. I’m always talking about space and bringing to as many people as possible. 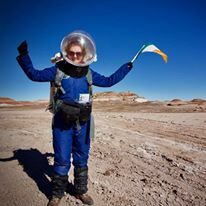 As well as the theatre shows, I participated in the ISU Space Studies Programme, a 9 week intensive programme in 2015 and then out of that I was invited to participate in a simulated Mars mission in the Utah dessert in early 2017 and I was also participated in a zero-gravity flight in Star City in Russia. I’m always talking about space and bringing to as many people as possible. I think they’re hugely important, we don’t realize that every time you’re around a child, you could potentially be a role model, they’re just picking up signals from us all the time. There was nobody really around me from the space perspective that I could call a role model. I think that’s why I didn’t achieve it until now. My Dad really encouraged me to embrace that technical and logical part of my brain. Other than that, a role model for me was my older brother – he was mad into space and science fiction, so anything he liked, I liked. My parents as well were really important role models for me. Dad really encouraged me to embrace that technical and logical part of my brain. He bought us a small personal computer when we were very young and I taught myself coding on that using Basic at the time which was the code. He showed me how to change a plug and he set me projects in the Summer where I would pick a planet and I would write a comic about it. So he obviously saw that in me and they were a big influence for me. Some of my teachers at school too, my English teacher, Sister Lee-Mary showed me that I was a lot more creative than I’d realised and encouraged that in me. My chemistry teacher Mrs.Greer loved chemistry and it sort of rubbed off on me and because of her it just copperfastened my confidence in STEM and wanting to pursue that field of study after I finished secondary school. I love that you bring the Stargazer Lottie doll along with you on all of your expeditions. How do you hope Lottie will inspire the next generation? [Lottie] dolls mirror the expectations and dreams that young girls want. So they are very much open to making dolls that mirror the expectations and dreams that those girls want. I think it’s just a fantastic initiative and I’m really proud that I bring her with me everywhere. When I go and talk to young girls in schools, the reason why I like it is that the doll – they attach with immediately and the fact that she’s also an Astronomer kind of shifts their perception of what a doll is for them. [The Lottie doll] is hopefully feeding into the message that they can be anything that they want to be. When I go in to talk to them we do a workshop around space and I map out the scale of the Universe, but we also talk about what they want to be when they grow up and all of that is positively attached to space, which is great, and also to the Lottie doll, so it’s hopefully all feeding into the message that they can be anything that they want to be. Success means to me without a doubt, that I didn’t give up on myself, that I was brave enough to live the life that I wanted. That I bet on myself. It’s been so many years that I’ve wanted to do this, and I never allowed myself to dream that big or to give myself that big a task without that big an objective. Every year that I work on it, that fear gets smaller and smaller and I’m able to take stronger and more brave steps forward. Success means to me without a doubt, that I didn’t give up on myself, that I was brave enough to live the life that I wanted. That I bet on myself. To me success would be knowing no matter what the outcome, that I didn’t give up on myself and the reason that if I achieve it or don’t achieve it, wasn’t because I gave up. I think that’s what success means to me and happiness – that in succeeding in what I wanted to do with my life, I’ve managed to bring as many people as I can with me along the way. So it can’t just be the action of me getting say to the Moon and looking back, it has to be something of much bigger value that that. That I can bring the general public with me and hope to get them to see the Earth from a new perspective. I think because my career journey is so bizzare, to take you through it – I went to college and did a degree in Engineering, and then I did a Masters in Engineering and then I did a PhD in Science. This was around the time that I’d kind of forgotten my childhood dreams at the time. I was always a creative person and when I finished my PhD I was in full-time research – I really didn’t enjoy it and knew that I had to make a change. I was going to emigrate to New Zealand to take up a new job in the same field of research and I thought that maybe it was the geography that was wrong. But it wasn’t, it was something in me that was wrong, there was something missing. I thought that it was the artistic part of my brain, so I stepped away from full-time research then and I started pursuing performing and getting work in that way, which was great. I think the thing that I didn’t expect was that after I was doing that for a couple of years, I really missed science terribly. I got a bit of a fright and thought that I’d made a major mistake, but I hadn’t. It was when things started to make sense for me. I realized that the person I am is this combination of loving information and loving technical details, but wanting to make them human and wanting to represent them in an everyday way so people who have no relationship with science whatsoever can find a way to understand it, and hopefully that be a springboard for their own curiosity to kind of take off. It was around the same time in 2011 that I realized that the person I am is this combination of loving information and loving technical details, but wanting to make them human and wanting to represent them in an everyday way so people who have no relationship with science whatsoever can find a way to understand it, and hopefully that be a springboard for their own curiosity to kind of take off. I realized I wasn’t that bad in it, as the combination of those two skills made me literate in science but also literate in how to communicate it in an everyday way, because that’s what I’d been doing for a number of years. 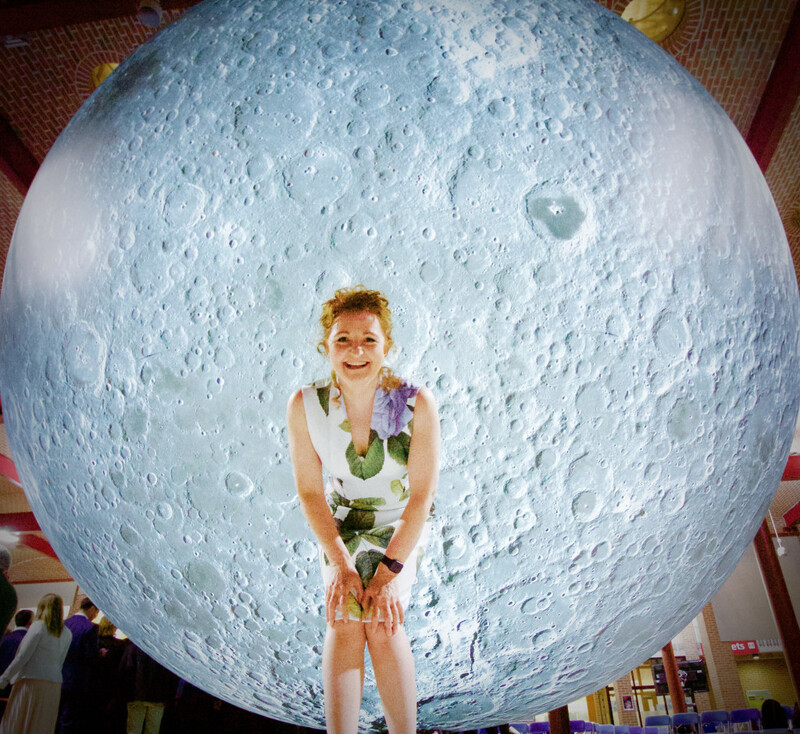 The lovely thing about that is that it’s really helped me in telling my Space story as well as me also being able to bring people along with me on my journey, because I’m able to humanize as best as I can – I’m not saying I’m perfect at it, but I’ve been able to humanize all of that science, technology, engineering and maths (STEM). So I didn’t expect it to all work out, I just thought that with all these things that weren’t joined, I’d finally get to the point where they all kind of worked together. Completely. Totally and utterly. There’s no doubt in my mind that they were the main influencers. My Dad is an Engineer and we were mad science fiction fans. He showed us the Moon landings and he showed me how to change a plug. It was just everywhere and I was very comfortable with science and technology from a very young age. I had a personal connection with it, so I was never afraid of it, or intimidated by it. I don’t think I was the absolute strongest in the class in maths by any means, but I was never intimidated by it and would give it a try and hope for the best, so they are totally and utterly [responsible for shaping my career path in STEM]. My teachers at secondary school too, but my parents had a huge impact with my relationship with STEM and my comfort with it. I think all I would say to my 10-year-old self was that you were right, you should’ve said it to people and not be afraid to say it out loud. Just because you were a girl didn’t mean it couldn’t have happened for you. I don’t think I could’ve changed anything about the course of my life, I think I should’ve just believed in myself more then that I could do it. Because I went right back to it anyway, so it was always there. I wanted to go to Space Camp and I wanted to go to [NASA’s] Kennedy Space Center, but we just weren’t a family that could afford that. So I guess if my parents were wealthier I would’ve put my foot down and insisted that we went somewhere like that, but we didn’t have that so I never did. So I don’t think I could’ve changed anything about the course of my life, I think I should’ve just believed in myself more then that I could do it. Because I went right back to it anyway, so it was always there. Read more about Niamh’s journey and recent events here. Through a highly successful 14-year career in the space industry, Dr. Olga Stelmakh-Drescher has lived and worked on multiple continents. Olga is impressively fluent in 5 languages, with experience in Europe at the European Space Agency and the German Aerospace Center, before relocating to North America, living and working in Montreal, Canada. She has most recently been based in Washington DC, USA as the Director of Business Development and International Affairs at the International Institute of Space Commerce. 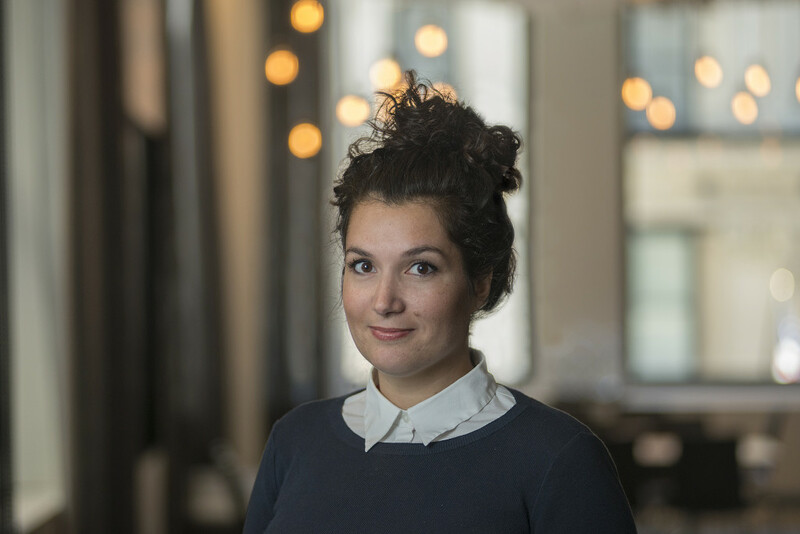 Olga talks to Rocket Women about her path as an aerospace lawyer, why she is inspired by space entrepreneurs and how her family is a perfect model of the international space community. 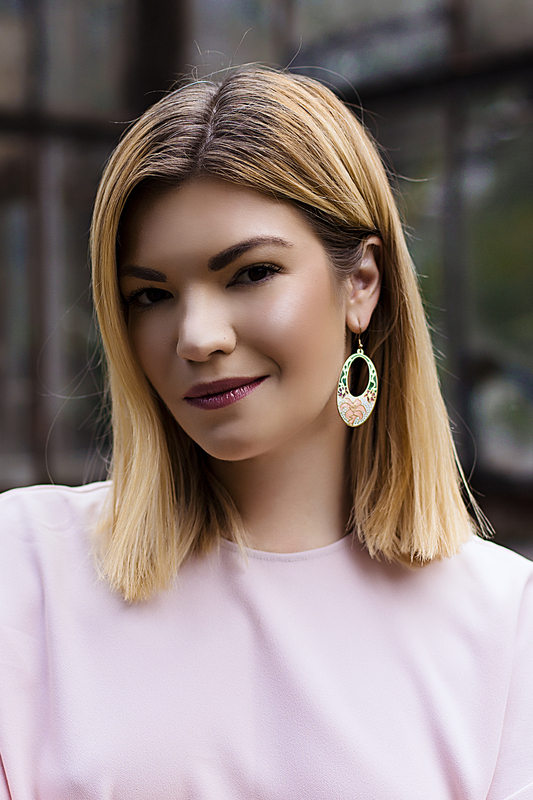 From growing up in Ukraine, to now being based in Washington DC – how have your international experiences helped to shape your career and personal life? During my school years I spent summer and most of my winter holidays in France with my French family. These people actually have been the ones who shaped my French identity and paved the way to my international professional future. As I was fluent in French and English I easily managed to enter the French business school and in parallel to my law degree in Ukraine over five years pursued business degree learning from the best. At that time, I already started working in the space sector providing legal support to the international space projects that also implied a significant international exposure strengthening thereof my cosmopolitan integrity. My life is spread over the continents; that implies lots of travels and high flexibility. Upon my graduation I had been offered to join an international law firm but decided to first get an advanced space and telecommunications law degree in Paris for which I was granted a scholarship of excellence by the French Ministry of Foreign Affairs. The strong professional touch of that program further opened me the doors to the European Space Agency, German Aerospace Center and later on helped me with relocation to North America making me competitive for the job positions in Montreal, Canada (Institute of Air and Space Law, McGill University) and in Washington DC, USA (GWU Space Policy Institute and currently the International Institute of Space Commerce). My life is spread over the continents; that implies lots of travels and high flexibility. I believe that my international experience, including the network I have created, actually played a decisive role in many opportunities I have been given throughout my professional career. In addition to the job opportunities mentioned above, the latter included invitations to speak at different fora, nominations and elections to high profile professional associations, selection to leadership programs, recognitions and awards etc. My husband, a German aerospace diplomat, and I, an aerospace lawyer with mix of Ukrainian and Armenian bloods, residing in Washington D.C. and communicating with each other in three languages, are a perfect family model of an internationalized space community. This has also influenced my personal life. My husband, a German aerospace diplomat, and I, an aerospace lawyer with mix of Ukrainian and Armenian bloods, residing in Washington D.C. and communicating with each other in three languages, are a perfect family model of an internationalised space community. It is hard to describe a typical day for me as every day brings something new, especially keeping in mind that I am very often on foreign travels. My day can be described as: Dream. Visualize. Rationalize. Implement. Not going into much detail my day can be described as: Dream. Visualize. Rationalize. Implement. This is supported by the following common elements without which the day would not be complete: reading news (political, economical and of course space ones) and books (mainly business or innovation related), drafting, checking emails, having telecons and meetings, networking at space events. I value the opportunities that enable looking at what I normally do through a different prism, encountering people whom I would more likely not met otherwise. Last but not least, when shaping my agenda, I make sure that it allows for personal “upgrading”, recharging and expanding of my horizons. I value the opportunities that enable looking at what I normally do through a different prism, encountering people whom I would more likely not met otherwise. In general, I think it is wrong to consider someone as a role model in its entirety. I would rather say that someone’s qualities, behaviors and accomplishments can serve as an inspiration for personal and professional growth. And to be honest in my case these are not “famous” people, but simply strong personalities with charisma and driving energy who are not afraid to take an action and be accountable for it. In one word (ok, four;) – I am “smart” addicted! When looking at the space sector the most inspirational to me are space entrepreneurs, I admire them for their powerful belief in their somewhat “out of this world” dreams and all the risks they take. My husband inspires me by his strength, power of generating great ideas, making impossible possible, strategic and comprehensive thinking, networking and presenting skills. Personally, I come from a highly-educated family and therefore I was blessed to have my family members as role models to me. They have achieved a lot, each of them in their specific field. My mother, who is a medical doctor, by her example, taught me to be fully dedicated to what I do; my father, who is a nuclear physicist, taught me to set the bar super high and always strive for better; my sister, a smart engineer and mother of three, – how to make the right choices and set priorities in life. Self-doubts and adversity are part of existentialism; without them we would not 1) become more self-confident and mature, 2) duly appreciate our achievements and 3) enjoy taking the risks, making new steps and going further. The “perfect” world is utopia and consequently the “perfect” people who seem not having such moments are the most fake ones. I am convinced that the turbulent times are the most promising ones, this is “where and when” we can most grow and evolve. We learn much more out of critical and stressful situations, this is where we see our real limits and strength. I am convinced that the turbulent times are the most promising ones, this is “where and when” we can most grow and evolve. 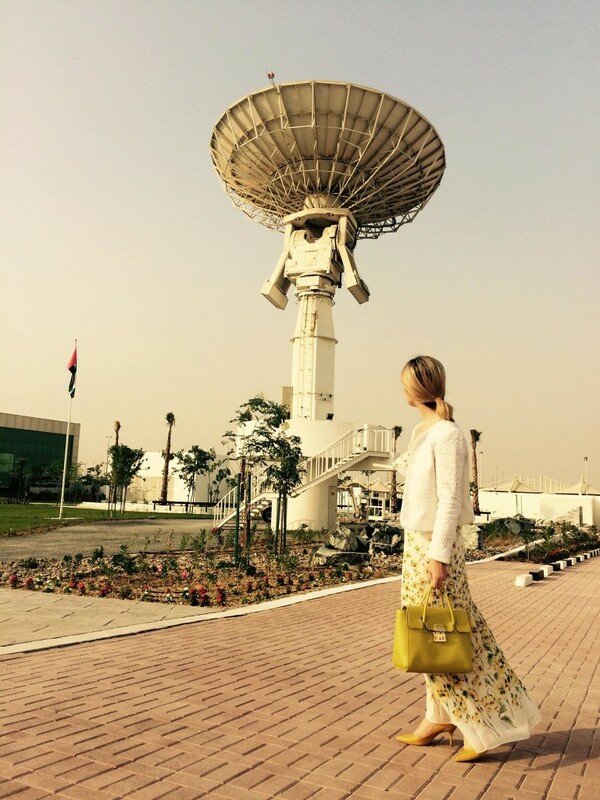 The space industry remains dominated by men, however I am very pleased to see more and more women in leadership positions, especially if they manage to become influencers. However, the level of inclusiveness still highly depends on cultural differences and domestic “in-house” traditions. Not naming specific countries, it is evident that in some of them space industry is the men’s world, i.e. “space patriarchate”, where women are given mainly the support functions. What are the biggest legal gaps and future challenges that the space industry is facing? Nowadays the space industry is facing numerous legal challenges, many of which occur as a result of a very fast pace of space technologies development and failing of a legal system to adjust accordingly to these NewSpace calls. What we observe today is that a space law capacity-building is following the developments of technologies, not playing a proactive role and therefore not ensuring the needed legal certainty (or even jeopardizing it, as the entrepreneurs will not wait for a legal framework to be shaped but instead will set precedents acting experimentally, making their own “wake-up” calls for an adequate legal enterprise). An appropriate legal enterprise should be established in parallel to (if not anticipating) major technological advancements, not allowing them to evolve detached paving their way in legal limbo. What would you recommend to someone looking at a career in space law to focus on? To someone looking at a career in space law I would recommend to first of all acquire a solid international and business law background combined with interdisciplinary space related studies (e.g. Space Studies Program of the International Space University). Ideally, theoretical knowledge should be combined with legal practice, some academic work and strong emotional intelligence that is needed when dealing with various actors. Ideally, theoretical knowledge should be combined with legal practice, some academic work and strong emotional intelligence that is needed when dealing with various actors. Very importantly, the successful space lawyer should not be skeptical, but rather has to foresee all possible scenarios with associated risks and opportunities and diligently guide towards the most appropriate way ahead. I always advocate for global thinking that provides for transforming numerous puzzles into one holistic picture. I always advocate for global thinking that provides for transforming numerous puzzles into one holistic picture. Similar to the data that can be acquired by means of remote sensing, a lawyer can much easier comprehend the problem if thinking big and not in the dimensions of a concrete case. Honestly, I do not like to think how something would have been if … Perhaps if I would have done something differently, I would have been a different person and honestly I am happy with current myself. Projecting and visualizing the future, especially successful implementation of my ideas and plans, this is what I prefer. Past is something that did happen to us but the future is what excites me more as we can influence it. As a piece of advice to all 10-year-old kids I would say: dream, demonstrate more curiosity, be passionate about what you like doing, be open and hungry for new knowledge, be a personality and do not be afraid to be different / think differently. As a piece of advice to all 10-year-old kids I would say: dream, demonstrate more curiosity, be passionate about what you like doing, be open and hungry for new knowledge, be a personality and do not be afraid to be different / think differently, be creative, challenge yourself, strive to become an educated person and not a nerd, do not anticipate time and do not look for a universal algorithm of success, instead create your own story, read more and learn more languages as it is a constituent part of culture and mentality and therefore an enormous facilitator for your future.